The ED310 is a high visibility (4" high digits) time of day Ethernet wall clock. The ED310's Ethernet connection allows its internal time-of-day clock to be periodically synchronized with a host computer clock over the network. Time can be displayed in either standard military (00:00 - 23:59) format or in AM/PM (12:00AM - 11:59PM) format. Alarms can be set to trigger either the internal bell or an optional relay. The network interface supports both 10BaseT and 100BaseT Ethernet connections. Optional 802.11b/g wireless connectivity is also available. The ED310 is intended to be used as an employee time display which can be synchronized to a master system clock via the network. Normally, a host computer on the network is designated as the master clock and will periodically update the time and date on all of the employee time clock (EC305) devices. The ED310 time display can be updated at the same time creating a completely synchronized timing system. A utility program (ET200UP) is provided with the ED310 that can be used to perform the update. If the host computer has internet access the system clock can also be synchronized with the NIST atomic clock. The ED310 can be programmed to trigger an alarm at a certain time of day. Up to 32 alarms can be set and each alarm will either activate the internal bell or one of the 4 optional relay outputs. Alarms that trigger a relay output can be used to activate exter-nal bells, lights, counters, etc. The length of time that a relay is active can also be set by the alarm. The ED310 connects to a 10BaseT or 100BaseT hub (or switch) via a standard RJ-45 Ethernet (CAT 5) cable. From a network perspective it occupies a single "socket" at a specified TCP/IP address and port number. The device must be configured with a unique IP address, net mask, and port number BEFORE it is installed on the network (see "Net-work Configuration"). The host software communi-cates with the ED310 by establishing a connection with it and then sending and receiving ASCII text command strings (see Software Interface). Optional Power over Ethernet (PoE) capacity is now available. 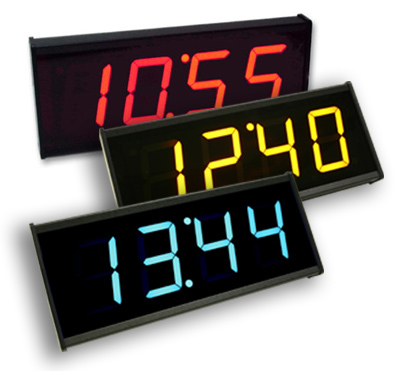 The ED310 has a four (4) digit, seven (7) segment LED display which displays the time in HH:MM format. Each of the red digits is 4" high and can be viewed from a distance of 100 feet. In the upper left corner is a dot use as a PM indicator used when the time is displayed in the Am/Pm mode. When ED310 is first powered on all display segments will be lit for about 2 seconds to verify their operation. The serial RS-232 port is used to initially configure the ED310 via the "Aux Command Mode" which provides local communications with a terminal or computer. Access to the serial port is provided by a DB9M connector configured as a DTE device. The ED310 can be equipped with four (4) solid state relay (SSR) outputs that can be individually activated as an alarm output. Each relay has a single "form A" contact rated at 10va (100vdc, 100ma.) maximum. If larger loads must be controlled use of an external relay is required. The relay outputs can be optionally configured to directly activate an external 12Vdc relay. For more information on external connections see application note AN0202 (pdf). The ED310 is powered by a 12Vdc power adapter that plugs directly into a 120vac receptacle. Typical power consumption is less than 12 watts. Alternate power supplies are available for international customers or the ED310 can be powered using a 12Vdc supply connected to the power jack. The ED310 includes a bracket on the back side which allows the time display to be mounted on a vertical surface. Two (2) key hole slots in the bracket can be used to hang the ED310 with screws on a vertical surface. The bracket can be inverted or removed as desired. Software communications with the ED310 is simple and straight forward. The primary TCP/IP port is used for communications with the user application program. Normally, the host software (client) is responsible for establishing a network connection with the ED310 (server) on a specified port. Alternately, the ED310 can be configured to automatically establish a connec-tion (client) with a host computer application (server) using the SERVER parameter. Once the connection is established the host applica-tion software can set the time & date or other com-mands to the ED310. Typically, the data transfer is accomplished in ASCII character strings to minimize network packet traffic. The communications protocol is determined by the emulation mode and can be changed dynamically by the host software.